Today I said, “I love you,” to a man I’ve never said those words to, a man who has been one of the biggest influences on my life, a man I have loved for years without telling him that. I think he has always known. I think we both have always known that we had a special bond even though the years often passed with only infrequent phone calls. Life was always busy and our paths which once were parallel, now went in different directions. Jerry McNellis appeared in my life as a seven-foot god towering over my future. He was a thought leader in the field of creative collaboration and I was writing my second book. I timidly approached him for an interview and, while he remained rather gruff during the interview, he generously gave me insight into his process of “Compression Planning” which became an important part of the book. 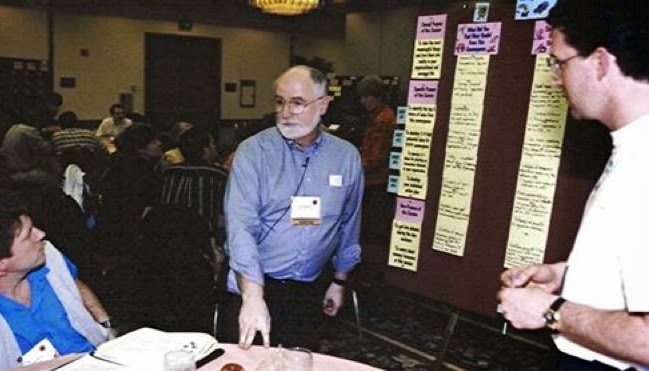 A couple of years later when I decided to create a conference on creativity and innovation for business people (this was in the early 1990s when there were no conferences like that), Jerry was the first person I wanted as part of the conference. I remember that first heart-pounding, stammering call … asking him if he’d like to be part of a new conference, produced by someone who had never done a conference before, travel all the way across the country … and, oh by the way, would he mind paying his own way? No one was more surprised than I when he said, “Yes." It was like God had spoken, parted the clouds and said, “This is going to work!” I knew if Jerry McNellis was going to be part of the conference, it would be a success. And, it was. When Jerry and I finally met, I discovered that he wasn’t seven feet tall. He was actually rather short and his body was twisted by childhood polio … plus he was just recovering from a life-altering health crisis as well as the ending of his thirty-year marriage. I was humbled by the confidence he had shown in my fledgling undertaking … and I think for him, the conference was his coming back to life party. After the conference, I wanted to send Jerry a present but nothing seemed right. Finally, I settled on a pillow I had needlepointed many years before with the words, “This, too, shall pass.” It was old and worn but I thought it might bring him some comfort. We’ve laughed often about his reaction to receiving an old, frayed pillow as a present, but I think it sealed our friendship. Today, Jerry is facing another health crisis, presumably his last. I know that he will handle this part of his life with the same humor and zest that he has brought to every aspect of his life. HIs son, Pat, called me with the news and told me that one of the first things Jerry said was, “I guess I can drop my Weight Watchers membership now.” That’s Jerry. Several years ago Jerry wrote a book about his remarkable mother that helped me understand more about how he became the man he is. When Jerry was stricken with polio at age three and required four months of hospitalization, his mother told everyone, “Don’t pick him up!” Let him fall and find his own way to get up. Reading this book you become part of his early life, watching him learn how to pick himself up ... part of the 17 surgeries and dozens of body-casts ... part of the endless doctor visits, hospital stays, home exercise routines ... but, mostly you get to watch the development of a soaring spirit that never saw disability, just a need to do things in a different way. Jerry played football, rigged a contraption that allowed him to ice-skate, climbed trees ... and fell out of them ... with a cast on ... danced, dreamed and lived life on his own terms. I love you, Jerry McNellis … I should have told you sooner. You have been a gift to so many people and you have always been one of my heroes. May you be surrounded and loved by family and friends during this last stage of picking yourself up. You will be so missed.